Manley SLAM!® Stereo Limiter and Micpre — Manley Laboratories, Inc.
SLAM! stands for "Stereo Limiter And Micpre" and it pretty much describes what it will do to most VU meters. We had to put a switch on this limiter to drop its internal VU meters down 3 & 6dB to keep the poor little needles from bending– it'll get LOUD fast (hence the exclamation mark). And on top of being an amazing pair of (actually four) Limiters, and Class A tube mic preamps, it also has masters degrees in DI, AtoD and DtoA, VU and PPM but that was too much for an acronym. When it comes to classic gear, especially classic limiters, we can all agree numbers like LA2s, 1176s, 2264s, and others come to mind. What if all those sounds were to be found in one stereo tube unit. Interested? We combined our favorite Electro-Optical circuit (ELOP®) with a damn fast FET based brick-wall limiter reminiscent of some cool classics. And we added a sidechain filter that can remove low frequencies that makes it more useful for a variety of tasks, while retaining that easy, "it just works" quality that has made it a favorite for vocals everywhere. The FET-based limiter has different desirable characteristics that both optimize the signal for digital recording, due to the brick-wall capability, and let you dial in how clean or crunchy, or punchy, and how loud and proud you want it. "...my feeling after living with it for a while is that although you don’t get too many of these to the pound or dollar, as far as I’m concerned in the right hands and working situation the Mastering SLAM! is worth every penny or cent." "SLAM! is the ultimate analog front and back end for any recording studio...All of my clients want this process for louder mixes, and SLAM! gets there with a gorgeous sound and a minimum of sonic mangling." "The SLAM! is the coolest high-end pro audio product I have seen and heard in a long time, and if I did not already own all that other gear, it would land at the top of my list." "One thing is for sure...the Manley SLAM! is one of the year's most unique offerings and will be worth every penny you pay for it." GET IN: The SLAM! starts with tube Mic Preamps on both channels with selectable phase reverse, high pass filter, and switchable phantom power (on the back panel). We’ve got plenty of gain for you in this new tube circuit, up to 60dB with 20dB more in the limiter– plenty for soft singers using low output ribbon mics. The input attenuator is right up front, like a variable pad so your loud rock ‘n’ rollers won’t cause a problem either. Track direct with the Direct Instrument input or bring your line level inputs into the SLAM! for processing. The DI inputs have selectable input impedance, depending on how far you plug the 1/4" cable into the jack: push it in all the way and the input impedance is 100KOhms, pull it out halfway and it becomes 10 megOhms which reduces pickup loading and allows all the highs to get through. Come on in! The ELOP® LIMITER: Our beloved Electro-Optical Levelling Amplifier circuit, the ELOP®, still the favorite for vocal tracking, shows up here with its new switchable side-chain high pass filter making it much more useful for mixes and other tracks as well. One of the most appreciated aspects of our original ELOP® is the simplicity of a two knob limiter, which is optimum for demanding pro recording pressures. You can still grab two knobs and have complete control of level and dynamics and be ready to hit that record button. Intuitive controls and a straight ahead signal path through quality components simply work. The ELOP® limiter implementation is done like we did in our VOXBOX® which pioneered the idea of limiting the mic signal before it hits any active stage. The ELOP limiter moves to the line stage when LINE is selected. The ELOP sidechain provides different HP filters on a toggle. The 200 Hz setting has been tailored for vocals and adds a touch of de-essing. The FET LIMITER: Here’s a new fast FET based "brick wall" limiter that spans the range of clean predictable limiting to the grunge and gravel that other FET based limiters are desired for. The FET RELEASE control allows you to dial up a variety of colors. There is even a "CLIP" setting that provides as round a shape as has ever been available. (Read more below about the CLIP settings.) We aimed at "sound" first, then experimented with circuits until we heard what we wanted discovering fresh approaches that provide a very wide range of useful dynamic control. For example, you can set up for a fast brick wall limiter with slower releases for minimum artifacts, or go with the faster releases to get some crunch and then get extreme loudness. The Attack control is unusual too providing the sonic control common with its historic brothers but very unusually retaining the zero overshoot “none-shall-pass” brick wall that defines a real limiter. And it’s punchy! As the saying goes, “Louder is better.” The SLAM! optimizes levels to analog to digital converters with ballz, warmth and loudness verging on silly or just clean and safe. What is especially nifty is the ability to use the ELOP® and FET limiters together at the same time dialing in whatever amounts of each effect you like. Every limiter has its own character or sound and here we have combined two powerful world-class tools that can be uniquely blended and mixed to taste and purpose. Even the metering is appropriate for each limiter so you can easily see how each is contributing. Metering on the SLAM! is exceptional. The two full size real VU meters show you the raw input levels, the final output levels, and the ELOP® Limiter gain reduction in the traditionally preferred format for visually displaying apparent loudness. VU’s are cool. Noticing how mastering engineers often need a switchable pad on their VU's because the "optimized" levels tend to pin the needles in the red, the SLAM! VU’s also have a 0, -3dB, -6dB switch to help with this situation. There are also very fast and super accurate multi-color LED ladder peak meters that display the input and output levels and the FET gain reduction, and some combinations. They will do Peak, Peak Hold timed, and Peak Hold until reset, and also allow you to manually set where the individual bars change colors to match your other gear. And with maximum clean I/O levels of +30 dBu, it is a lot more likely you will use these meters to see what’s clipping downstream. It probably won’t be the Manley tube line drivers inside! The back panel should keep everybody happy. In the sea of jacks including the big power supply connector, you'll find all the usual XLR’s for transformer balanced I/O and 1/4" phone jacks for direct unbalanced I/O. Eight Bantam jacks in a mini-patchbay configuration handle the side-chain inserts and linking functions. You can insert EQs into the ELOP® and FET limiters, and there are more jacks for you to mix in an external signal into the side chains. Another pair of jacks provides for easy linking for 5.1 surround work if you have three or four SLAM!'s. It’s all here. Speaking of Linking... all previous Manley dynamics units require both channels to be setup for near identical settings rather than the more common "just set the Left side". The SLAM! lets you do it both ways. The "L Side" method is the "STEREO LINK" mode and is quick and convenient but, like others, uses a mono mix for the side-chain. The "BOTH & EXT" adds the rear panel link jacks to the link buss so you could chain up several SLAM!s for linked surround work. Both or all 6 channels should be set similarly. This mode is usually better for mastering as it responds to the true peak level of the channels rather than an artificial mono mix. Outside the Box, that's where the power supply is. The illuminated power switch turns on the external power supply. Keeping the power supply far away also keeps additional heat and magnetic fields away from the precious audio. The power supply is housed in a sturdy cast aluminum 7" x 4" x 5" box that is easy to mount to or place in the bottom of a rack. A seriously humongous 16 pin connector, and 6' multicore cable connects the two boxes. The SLAM! also seems a natural as a mastering tool. The FET limiter works great on mixes, and the ELOP® now has a high pass filter switch that is spot-on for mastering. We offer a dedicated mastering version which eliminates the mic preamps, adds detented controls replacing the pots, and provides extra metering options. Manley compressors and EQs seem to be the most popular pieces of gear ever when it comes to mastering. The ultimate analog rack for the final important touches to the mix would have include the SLAM!, The Variable Mu® and The Massive Passive. Combine this with some digital processors of similar calibre and one has a respectable and very effective set of mastering tools. That Manley rack plus some Manley Microphones would make an ultimate stereo recording chain too. This is gear you’ll want to keep for a lifetime. Outboard Power Supply: factory set for 100V, 120V or 220-240VAC operation for original destination country's mains voltage. Proudly from our beginning, we at MANLEY LABS have been closely involved with numerous mastering facilities around the world. For these most demanding engineers in our industry, we have created specialised products such as our all-tube tape repro head amps, digital converters, high-powered vacuum tube monitor amplifiers, through to custom monitoring consoles, all the way up to complete facility design and installation. First off: no microphone preamps. You mastering engineers certainly don't need those. The mic pre and input select switch are removed and the switches become dedicated "mode" switches one each for the ELOP and the FET limiters. 1) The ELOP limiter gets more Ratios - 10:1, 5:1, 3:1, 2:1 and something new called AutoHF which starts off as a 1.5:1 ratio and increases gradually to 10:1 for highs. This is something like a de-esser, and of course can work with the ELOP SC toggle at 200Hz for even more effect. 6) There are no pots on the faceplate of the Mastering Version of the SLAM! 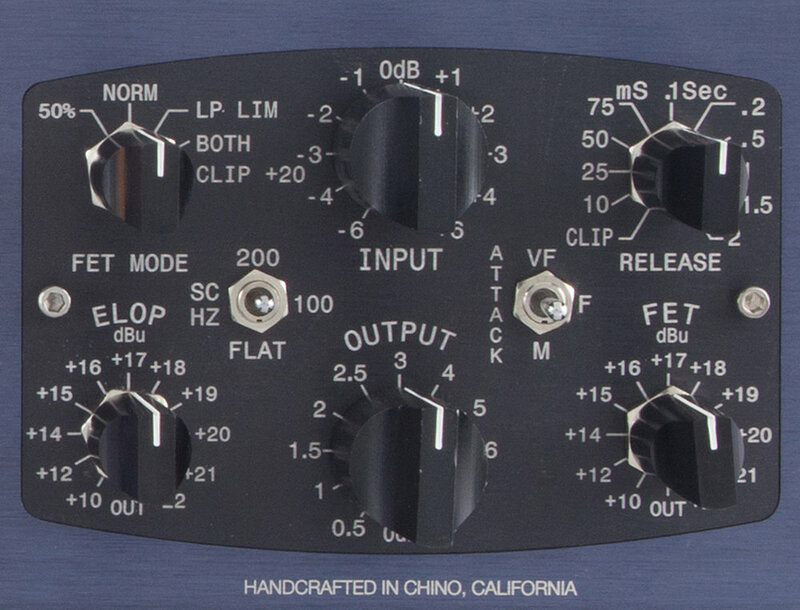 All of the knobs in the Mastering Version are discrete detented switches in mostly 1 dB steps, with some appropriate 1/2 dB and 2 dB steps, right where they should be. More than that, we really like the way it works and sounds and we generally prefer it to the non-mastering version for stereo tracks. There is a lot less fiddling involved to maintain L/R balances and the new modes are subtle but fun. It is easy to make just about anything sound better.